As recently as 60 years ago, we humans believed we were the only animals on Earth that could use tools. That impression was proved wrong in 1960 when famed primatologist Jane Goodall observed chimpanzees using twigs to fish termites out of their mounds, and since then, we’ve realized that quite a few of our fellow creatures rely on equipment to get the job done. 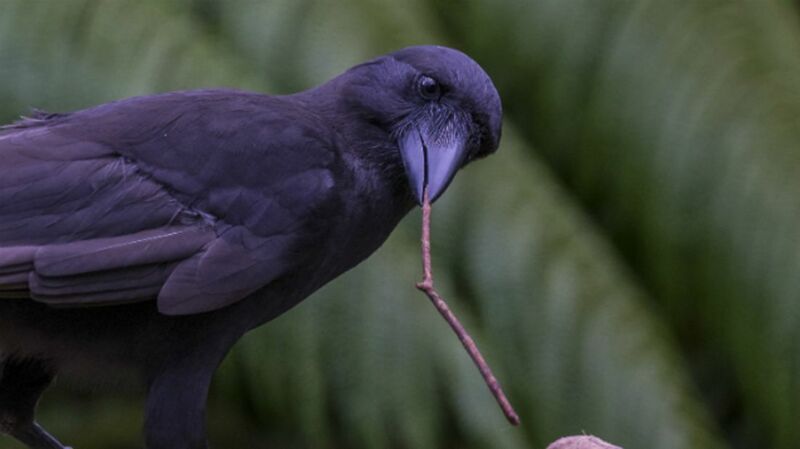 The latest member of the Clever Tool Users club is the Hawaiian crow, whose resourcefulness is described in a new paper in the journal Nature. Tool use is not completely unheard of in crows. The New Caledonian crow (Corvus moneduloides) is well known for its advanced problem-solving behaviors. Captive and wild crows alike make their own prods, poles, and scoops out of leaves and twigs. They’ve been at it so long that their beaks have actually evolved to better hold sticks. But they were the only ones—or so we thought. Then researchers took a closer look at a super-rare Hawaiian crow called the ‘Alalā (Corvus hawaiiensis). There are only 131 ‘Alalā left on the planet, all living in conservation facilities on Hawaii’s big island and Maui. The leaders of the Hawaii Endangered Bird Conservation Program (run by San Diego Zoo Global) had seen the birds occasionally picking up and using sticks, but didn’t think much of it until they were contacted by crow researchers at the University of St. Andrews in the UK. The two teams decided to work together to put the ‘Alalā’s skills to the test. They designed a series of puzzles involving logs studded with little pieces of meat. The meat was far enough inside the logs that the birds couldn’t reach it with their bills. They’d have to get creative. And that’s exactly what they did. Of the 104 birds tested, 81 grabbed sticks and got to work. They were selective, too, tossing twigs that didn’t fit or trimming the sticks to the right shape and size. They hadn’t been trained ahead of time, and they didn’t even have to think about it. “Using tools comes naturally to ‘Alalā,” lead author Christian Rutz of the University of St. Andrews said in a statement. While Hawaiian and New Caledonian crows are, of course, related, they're not closely so; the two species split around 11 million years ago and live almost 4000 miles apart. The researchers say their tool use skills likely evolved independently.